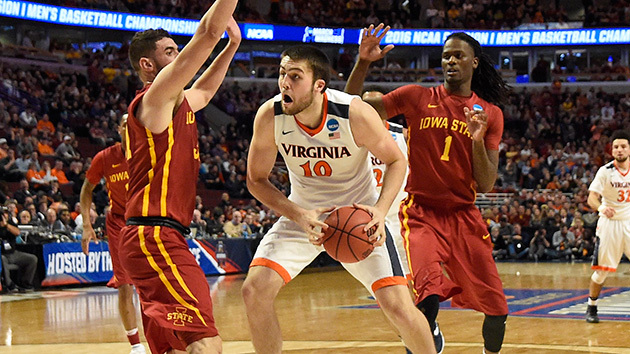 Impact 7-footers are rare in the college game, but Virginia senior center Mike Tobey is a big reason why the Cavaliers are in the Elite Eight. Teams used to match up against an opponent’s size; now they match up against speed. This is a problem for Tobey, a 7-footer who started the first game of his first year at Virginia but is coming off the bench at the end of his last one. He has a hard time chasing smaller players, or to be more blunt: He has a hard time catching them. But sometimes, there's a man for his time and place. He fits right in there. And Tobey was that dude in Chicago. Virginia coach Tony Bennett smartly bet that Iowa State senior forward Jameel McKay was not athletic enough to punish Tobey. Tobey responded with 18 points (on 8-of-12 shooting from the field, in just 20 minutes) and four offensive rebounds (Iowa State had two the whole game). Tobey was not No. 1 seed Virginia’s best player in its 84–71 win over the No. 4 Cyclones in the Midwest Regional semifinal. That was senior forward Anthony Gill, who scored 23 points and hauled in eight rebounds. But Tobey played a huge role. He played, you could say, with reckless abandon. That’s not my phrase. It’s his. Iowa State had a chance going into this game. It evaporated for three reasons: Virginia’s hot start, Cyclone senior star Georges Niang’s bogus fourth foul and Tobey. He was a reminder that a big guy with nice touch around the basket still has a place in today’s game. And he was a reminder that the Cavaliers are more versatile offensively than critics realize, and that their national-title hopes are as legitimate as any team’s. It is easy, and lazy, to dismiss Virginia as a regular-season wonder, as though finishing first, first and second in the nation’s best basketball conference in the past three seasons is a sign of weakness. But college basketball history is full of programs that supposedly couldn’t hoist the trophy, then did it. Bennett’s last two teams were easier to de-fang in the postseason. This one is offensively diverse and efficient. All-America senior guard Malcolm Brogdon only made 4 of 13 shots against Iowa State, and it didn’t matter. As junior point guard London Perrantes said: "We're a different-style team. But our defense isn't going anywhere." It seems simple, but try guarding it. Try showing up at the United Center with Final Four dreams, a team capable of fulfilling them and so much of the crowd dressed in your colors. That was the Iowa State Cyclones here Friday, and a slow 7-foot senior came off the bench and destroyed them. Virginia will keep on knocking. Good luck to everybody on the other side of the door.